Wooden bathtubs, crafted from waterproofed marine wood, bring a warmth into your space that other materials can't mimic, and its design can adapt to any room design. Wood can warm up an otherwise tiled or stone-filled bathroom, creating a comfortable Zen escape. Experiment with different stains, rugs, and artwork to find the desired effect. Stainless steel offers simplicity with an edgy, urban feel. And from a functional perspective, stainless steel bathtubs are not only durable, but they also help maintain your bathwater's just-right temperature. Marble lends itself well to any space and style—even the master bath. Marble is versatile and comes in different hues and patterns, making your marble bathtub totally unique. Try darker marble with tighter patterns to give a big bright room a stunning focal point or lighter marble to open up a smaller space. Copper has a beautiful natural luster that adds a rustic look. The metal's natural patina and long-lasting durability make it a worthwhile investment if the look incorporates well with your master bath. The minimalists out there will fall in love with glass bathtub ideas. Glass gives you the clean lines and organic feel popular in minimalist design. 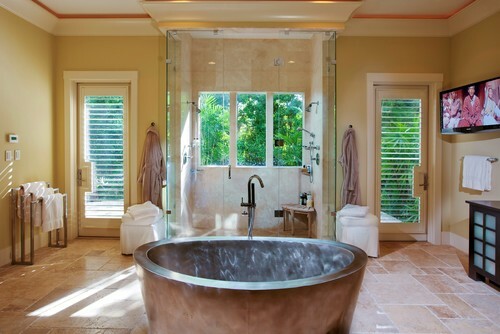 Paired with bright lighting and simple art, a glass bathing area makes its own statement. Whether you'd like to take a traditional approach to bathroom design of you're interested in more unique bathtub ideas for your Dallas area home, contact Stephanie Kratz Interiors.